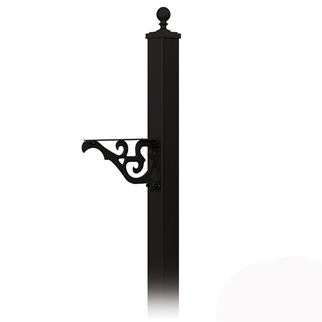 Our Decorative Mailbox Post is an in-ground mounted mailbox post - made of heavy duty aluminum and will accommodate our Salsbury Heavy Duty and Rural Style Mailboxes. It has a powder coated finish and is available in Black, Beige, Bronze, Green, White. This is a heavy duty post - weighing 30 pounds. Mailbox Installation requires a concrete footing. Mailbox Post Installation requires a concrete footing. Hardware to mount mailbox to post is included.